We all have a gift. At least that’s what my grandma used to say. While I have no gift or luck with cooking or finding Mr. Right, I do, however, have the gift of accessorising. The minute I walk into an Accessorize store, my sixth sense, my art of accessorising super power, takes over. I know exactly what I want and I know exactly how I will style it. Honestly, I haven't yet met a piece of (statement) accessory I cannot style! Of late, I have been experimenting with layering statement necklaces. While I love it, loads of my friends and readers find layering statement necklaces quite challenging. Layering (statement) necklaces is one of those things that, on paper, sounds effortless. In reality, when it comes to layering statement pieces, one can easily go from statement-making, to disaster-in-the-making! 1. Have a Common Theme: Be it colour palette, specific style, a certain kind of look, texture, shape or material, there has to be one common theme that holds the entire look together. Randomly layering necklaces, especially statement pieces that have no aesthetic rhythm or pattern is a major eye sore. 2. Balancing the Lengths: Just like a common theme is needed, so is propitiate spacing between layers of necklace necessary. To layer statement necklaces, the pieces need to be of different length. Also, the spacing between the necklaces should be equidistant for the final neckpiece to look visually appealing. 3. Harmony in Shape: The basic shapes of all the pieces does not necessarily have to match – but the lines should blend well. Especially, while layering necklaces of different shapes. If the design lines do not complement each other, the final look can easily go from chic to chaotic. Playing with candy colour pastel palette, layering three very different styles of necklaces to create an eye-catching blanket of baubles. 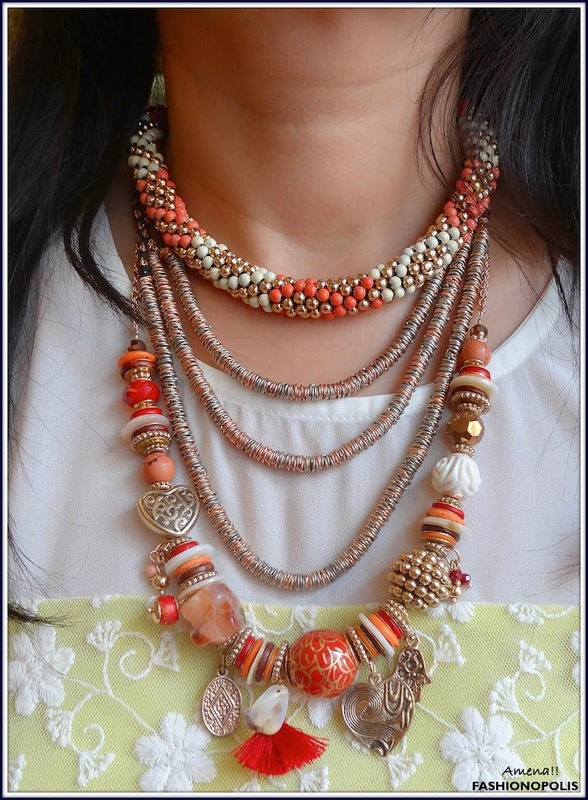 Inspired by trademark gypsy pieces- tassels, coins, heart charms, variety of different beads and metallic cords- this layered style is ideal for those who like to add an element of drama to their look. 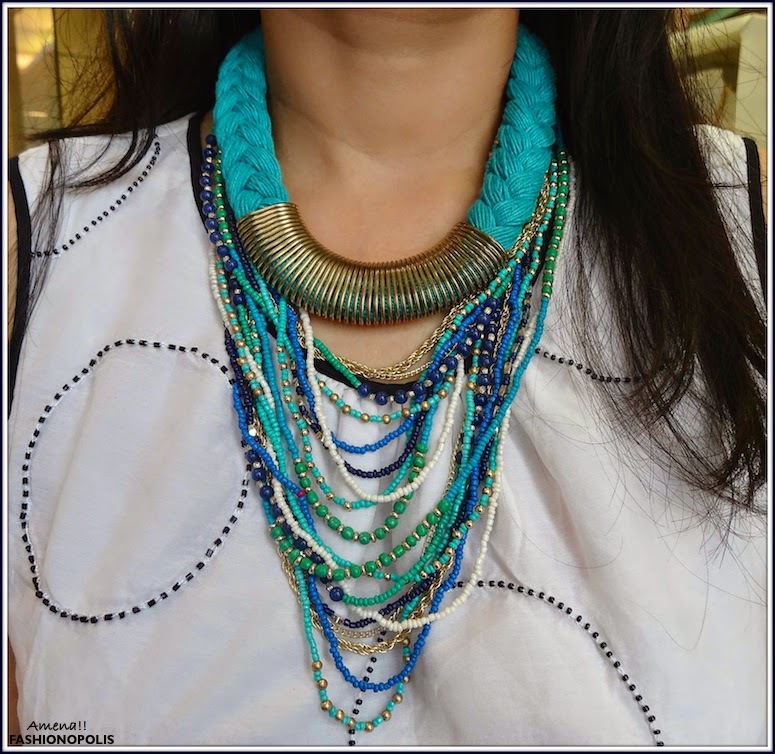 In shades of blue and green, different styles of tribal inspired necklaces- chunky plaited threads paired with dainty, rope-style, multi-coloured beads - are layered together to create one chic neckpiece. When a slinky stone collar necklace + a Perspex art deco inspired geometric motif necklace +metal rings cluster, rope-style cord necklace are layered together, street style magic is bound to happen. 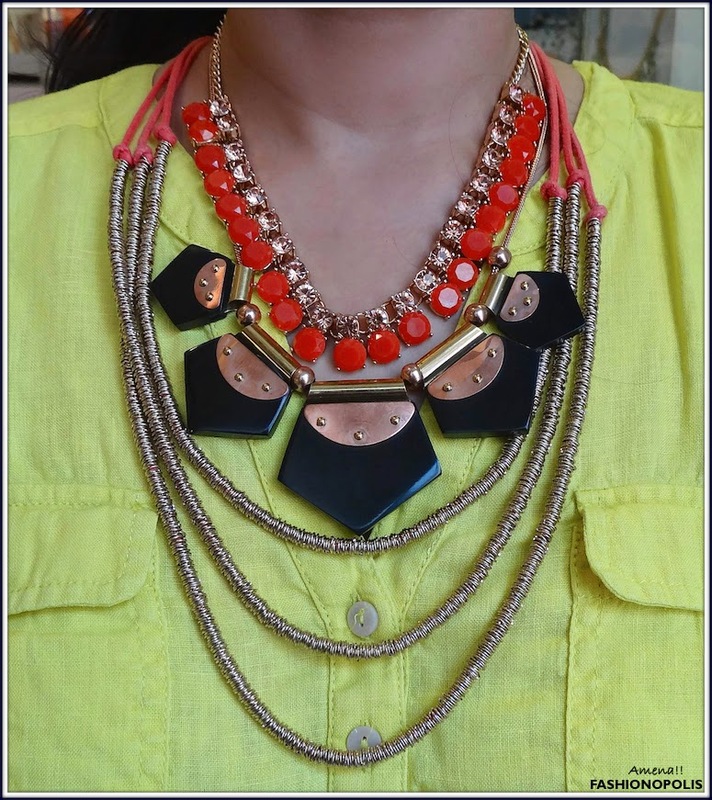 Mixing three distinctly different yet complementary statement necklaces to create a street style worthy neckpiece. If you’re looking to amp up the “wow” factor, all you need is, sparkling diamante and shiny gemstone encrusted statement necklaces. 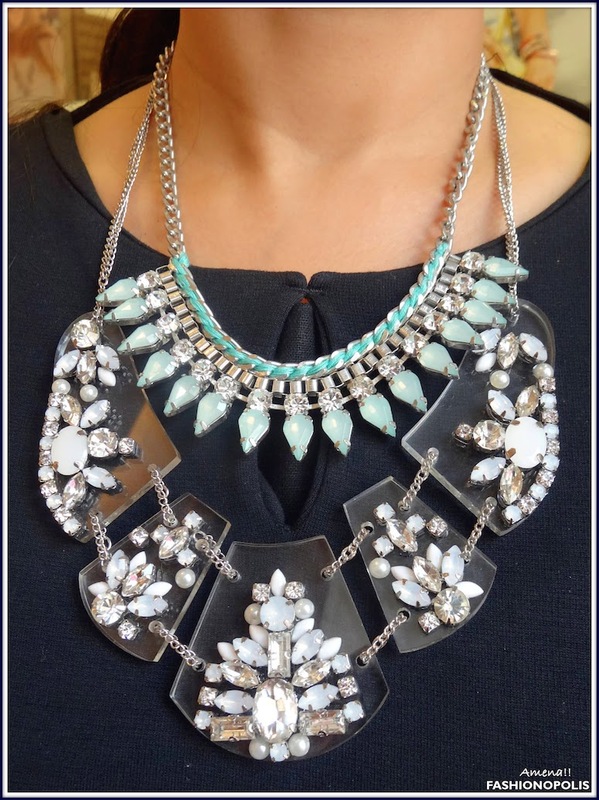 Layer them together and watch as heads turn your way to stare at the droolworthy masterpiece on your neck! 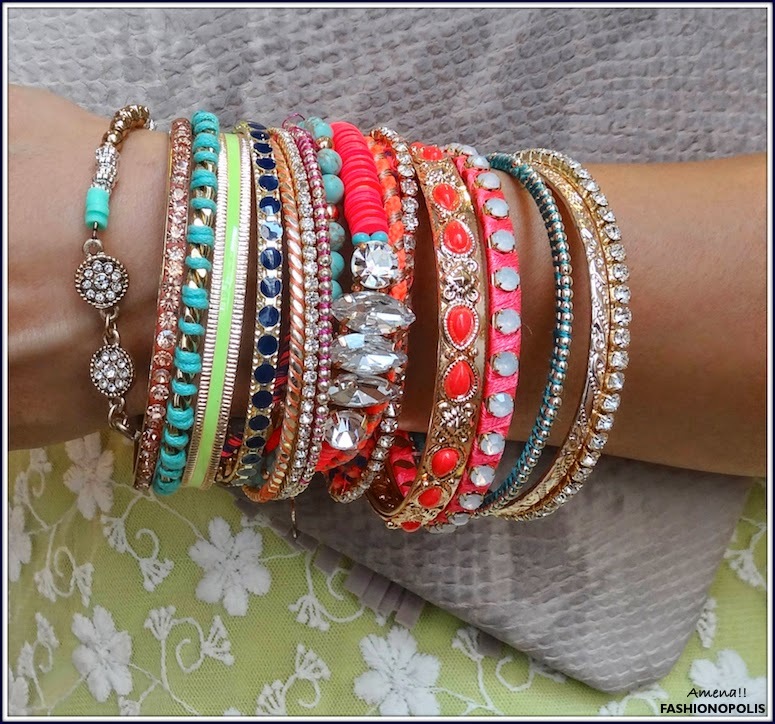 Ever since Leandra Medine of The Man Repeller started the cult of ‘Arm Party’, stacking multiple bangles and bracelets together has become a staple accessory trend.Even though this trend has been around for a couple of years, you will be surprised to find how many new stacking combinations are available for you to try. Get together an eclectic mix of beads, colour-braided cords, pop clustered sequins, glossy chains, sparkly gems and bejewelled bangles, and you swanky, colourful, arm party is ready. Add a few chunky gold bands along with luscious blue and green stone encrusted stretch bracelet, to create a spectacular stack of baubles. 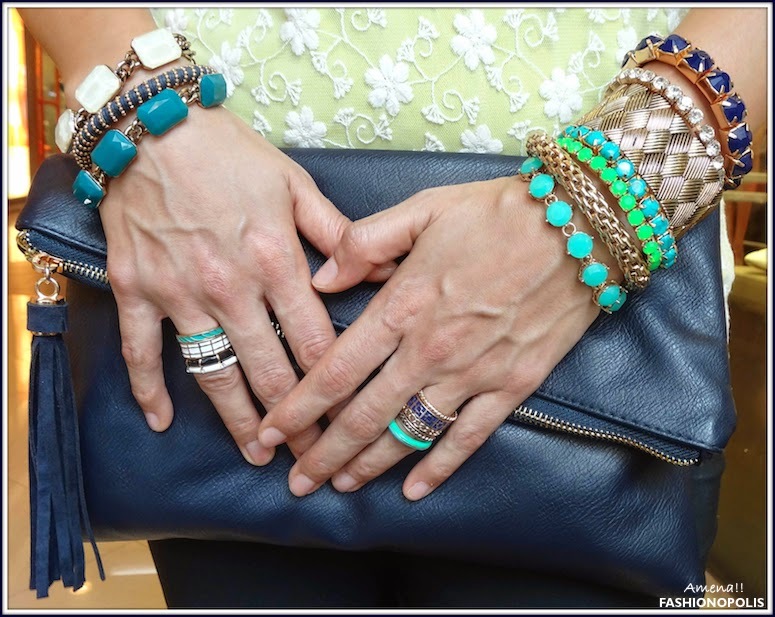 Throw in a few rings, and you got your hands full of an enviable arm party. Playing with sorbet shades, sacking three very distinctive styles of bangles and bracelets- enamel bangles, funky beaded bracelet and glittery stretchy bracelet-to create one statement making arm party. 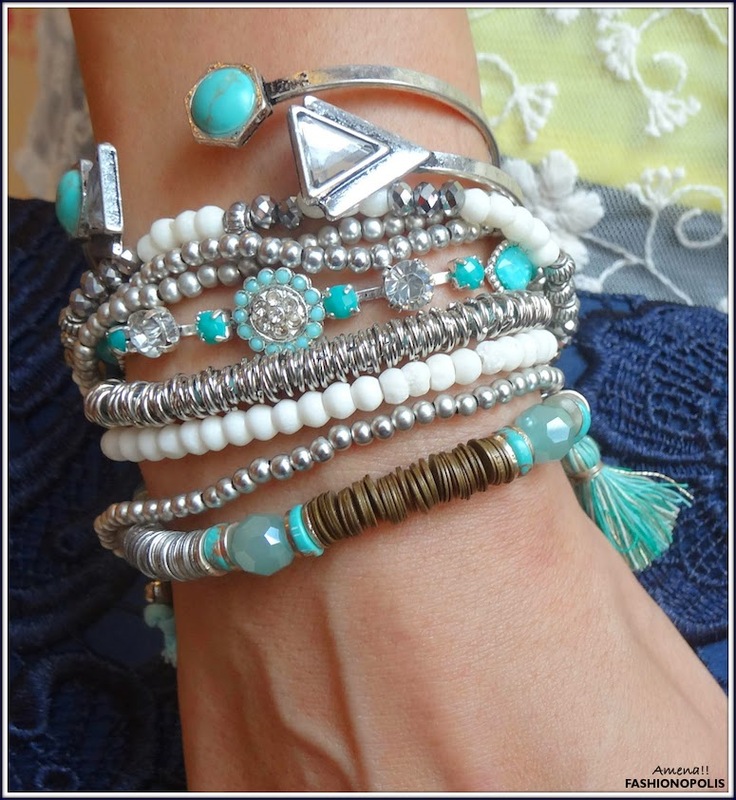 If you’re in a mood to show your boho side, all you need is, bracelets in turquoise and silver combo, adorned with tassels, daisies, beads and crystals. Stack them randomly and let your inner hippie come to life. A heartfelt thank you to my dear friend, Sakina, who took the time out to model all the above looks for me. Thank you for all your patiences and for doing this with me. Like me, are you as well obsessed with layering necklaces and stacking bangles and bracelets? Do share your views with me in the comment section. Love the way you have layered them all!!! It looks as if the neck pieces are a single one! Great post as usual Amena~! I love the arm party ideas you've done! Totally a post no one could rock better! I love this post. I'm always layering stuff so this is great to get ideas. Omg! I def will reference this post when layering. Very helpful...thanks! gorgeous accessories, we love this layered and stacked look! This is great! love all the different colours. Come by and check out my blog, if you like it I would love if you followed me. The layered necklaces look really nice. I was planning for something similar for the party I need to attend tonight. Thanks for the tips!